Keita was born the youngest of three children to parents Ernest and Marva Cooper. His family lived in a middle class community in Washington DC. Keita has a (BARCH) degree from Hampton University and an (MLA) from Cornell University. 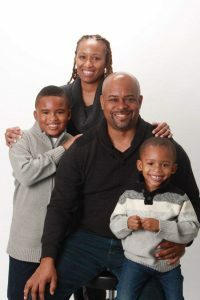 Shortly after finishing graduate school, Keita moved to Atlanta, Georgia where he met his beautiful wife Tracy and started a family. They now have two young boys Christian Isaiah and Chase Immanuel. Keita practices as a licensed architect in Atlanta in the hospitality industry. He is active with his church and has served as a mentor and coach to youth throughout his adult life. He currently serves on the Act of Kindness (AOK) committee for Living Word Church Ministries (LWCM). Keita enjoys traveling, hiking, fishing, grilling, biking and the great outdoors. His favorite activity is to spend time with his lovely wife and two boys. Keita’s favorite bible verse is the 23rd Psalm. He believes that his life’s purpose is to obey God’s will and serve others. Tracy grew up in the small town of Bainbridge GA, the child of Joseph and Bettye Trent. She is the youngest sibling of two half-brothers and two half-sisters. Tracy earned a B.S. degree in Psychology with a minor in Sociology from Georgia State University (GSU). She went on to obtain her Masters and Educational Specialist degrees in School Psychology also from GSU. Tracy met the love of her life Keita in Atlanta, Georgia and started a family. They now have two young boys Christian Isaiah and Chase Immanuel. Tracy owns her educational business, Infinity Psychoeducational Consulting Services LLC, offering a range of psychological services for children. She is a member of Delta Sigma Theta Sorority, Inc. and is also active with her church Living Word Church Ministries (LWCM). She currently serves on the Act of Kindness (AOK) committee for LWCM. Tracy enjoys traveling, yoga, guitar, music, and spending time with family and friends. Tracy’s favorite bible verse is Proverbs 3:5, “Trust in the Lord with all thine heart; and lean not unto thine own understanding”.